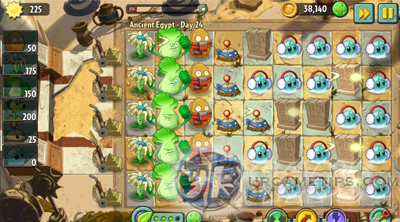 Here's a quick walkthrough and strategy guide for the "Ancient Egypt" stages in the action and arcade defense game - Plants vs. Zombies 2: It's About Time!. Follow and quickly deploy the suggested plant formation below to help you defend against the zombie hordes (not the only way though, just treat this as a guide). 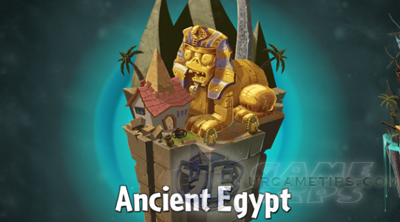 Ancient Egypt stages will introduce "graves", an obstacle that disrupts your plant formations and strategies. Graves can destroyed by dealing enough damage or by simply using the Grave Buster plant to remove them. - Plant fast to start the cool-downs and Sun gain per Sunflower! - Sunflower: Commonly placed on the 1st column, plant 5 asap. - Wall-Nut: To block tough zombies like Conehead, Buckethead and Pharaoh. - Potato Mine: Use it wisely, can deal great damages to zombies! - Cabbage-Pult: Can ignore graves because of their lobbed attacks. - Bloomerang: Can also clean up graves and good against Camel Zombies. - Iceberg Lettuce: Use it to slow down tough zombies, to extinguish Explorer Zombie's torch, and to give time for your Potato Mine to activate. - Bonk Choy: Great damage output, combo with Wall-Nuts. - Grave Buster: Can instantly destroy graves, useful but situational. 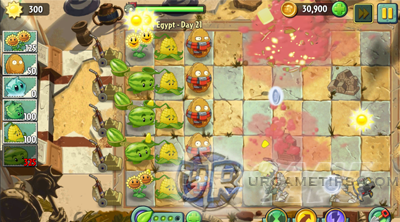 - Peashooter/Repeater/Twin Sunflower: You won't need them much for now. - Shovel: Use it to upgrade or replace plants. Example: Replace Cabbage-Pult with Bloomerang! 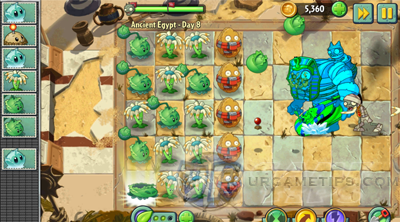 - As much as possible, use Plant Food during the final wave of zombies. - If you are having difficulty, you may use Power Ups if you like. - Plant Food: Peashooter or Wall-Nut. - Use Wall-Nut against Coneheads, and Potato Mines against Bucketheads. - Plant Food: Cabbage-Pult or Wall-Nut. - Potato Mines: Use against Buckethead zombies. - If you are having difficulty on other stages, you may use Power Ups if you like. - Plant Food: Cabbage-Pult when mobbed at final wave. - Iceberg Lettuce: To slow down tough zombies. - Match the symbols (3 symbols). - Plant Food: Save up your Plant Foods for Cabbage-Pult against Gargantuars. - Iceberg Lettuce: Save them up too for Gargantuars. - Wall-Nut: To block tough zombies or hordes. - Potato Mine: Use against Bucketheads and Gargantuars. - Power Up: If you want to use it, use Power Zap instead, others will not work! - Plant Food: Cabbage-Pult when mobbed. - Iceberg Lettuce: To extinguish Explorer zombie's torch. - Iceberg Lettuce: To slow down tough zombies or Tomb Raiser zombies. - Grave Buster: To remove graves and to counter Tomb Raiser zombies. - Plant Food: Bloomerang to defeat Buckethead zombies. - Shovel: Use it to replace Peashooters with Bloomerangs. - Iceberg Lettuce: To slow down Pharaoh zombies or Bucketheads. - Grave Buster: To remove graves for space. - Wall-Nut: Quickly replace if destroyed. - Shovel: Use it to replace Cabbage-Pults with Bloomerangs. - Plant Food: Cabbage-Pult when mobbed or Bonk Choy to defeat Pharaohs. - Match the symbols (4 symbols). - Iceberg Lettuce: To slow down tough zombies and for Explorer zombies. - 13 total plants plus Iceberg Lettuce (use one at a time). - Plant Food: Bonk Choy to defeat Bucketheads at final wave. - Wall-Nut: Use extra Sun to replace destroyed Wall-Nuts. - If there is a grave at the 1st 3 columns, just play on to destroy the grave first. - Plant Food: Cabbage-Pult at final wave. - Potato Mine: Use against Coneheads and Buckethead zombies. - Iceberg Lettuce: To slow down tough zombies and for Explorer zombies. Use it also to give time for your Potato Mines to activate. - 10 total plants plus Iceberg Lettuce and Potato Mine. - Refer to the screenshot below for specific formation. - Plant Food: Cabbage-Pult, save Plant Foods for the final wave. - Iceberg Lettuce: You must use Ice to all Explorer zombies! - Plant Food: Melon-Pult for massive damages! - Plant Food: Bonk Choy to defeat Bucketheads and Pharaoh zombies. You can also use all Plant Foods on your Wall-Nuts. - Iceberg Lettuce: To slow down tough zombies hitting your Wall-Nuts. - Match the symbols (5 symbols). Ignore Coins so you can focus more! - Refer to the screenshot below for sample formation. 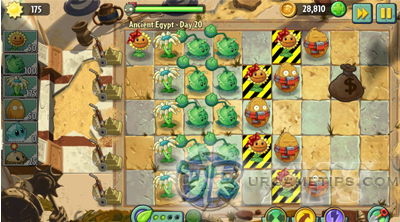 - Plant Food: Bonk Choy to defeat Pharaohs at final wave. - Potato Mine: To defeat tough zombies, plant it early and wisely! - Plant Food: Bonk Choy, once Dr. Zomboss summons some zombies, quickly place a Bonk Choy in front of it then use your Plant Food. This will be your main source of damage against the boss. - To save targeted plants, use your plant food on the plant right after the Zombot releases it's rocket missile. The animation will make it immune to damages! - Grave Buster: To clear Graves. - Iceberg Lettuce: To slow down Gargantuars and Dr. Zomboss.